Percussion instruments for kids can be used to introduce children to music. Younger children can start with simple percussion instruments such as tambourines, cymbals, triangles, maracas or bells while school age children can practice with drum sets. When it comes to bells, we recommend the Hohner Kids Bell (includes only one bell). It is designed for younger children (ages 3-6) meaning that it is easy to grip and has special safety features. What we like most about it is the beautiful sound produced by the bell. The bells also come in various nice colors. The only negative is the price at slightly over $10 for one bell which may seem a little steep. Bear in mind however that this is a good quality bell. If you are looking for a maraca, we recommend the Maracito (ages 3-6). It includes only one set, therefore you have to purchase many if you want to have many maracas. It is designed for little hands and just the right size. We also like the fact that it is very sturdy and good quality unlike other maracas which are made of cheap plastic. Tambourines are great percussion instruments for children. They have a membrane and jingles and they can be struck or shaken. The Remo Tambourine (ages 3-6) has 4 sets of jingles that produce a really nice sound. Its jingles are child safe. On the negatives, it is smaller than other tambourines bearing in mind however that it is designed for children as young as 3. Drums sets for kids are another great way to introduce younger children to music. Make sure that you do not get a drum that is too large as it would be difficult for a small child to handle. 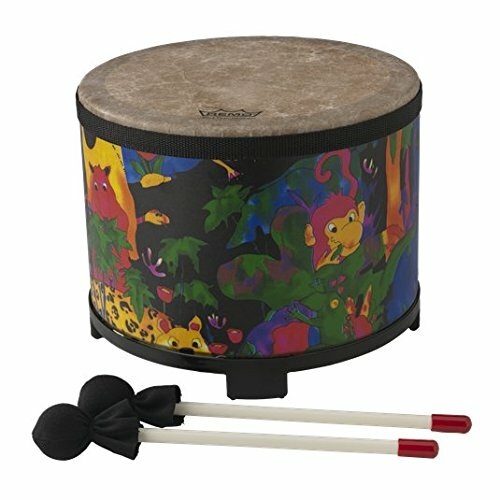 Your choice should be focused on drums sets for kids that are durable and that make a decent sound.We like the Remo Kids Percussion. Firstly, we love the look of it with its rainforest fabric. Secondly, it is made by Remo which is also a respected maker of professional drums for adults. Thirdly, this kids drums set is very sturdy and doesn't sound terrible unlike other toy drums. The drums set comes with mallets but you can also use it with drum sticks (by the way, you can get the Vic Firth American Classic Drum Sticks).